Kandice started at Campus Estates as a volunteer in 2012. She now works part-time as an assistant and receptionist while attending veterinary school at OVC. 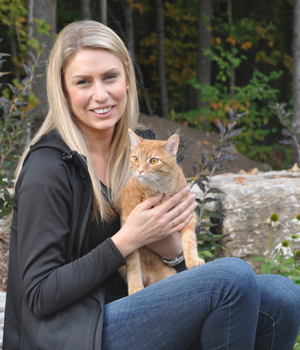 Before joining the CEAH team, Kandice graduated from the University of Guelph with her Bachelor of Science Honours degree, and she also obtained her Bachelor of Education degree from Nipissing University. Kandice has three cats, Peewee (9 yrs old), Sleeves (7 yrs old), and Stanley (2 yrs old), as well as Peanut (4 yrs old), a dog she rescued from South Korea. When not working or in school, Kandice enjoys travelling, playing sports, reading and visiting friends.